Symétriades/Extension is a visual experience that we created for an eponymous contemporary music piece for solo double bass and musical artificial intelligence. 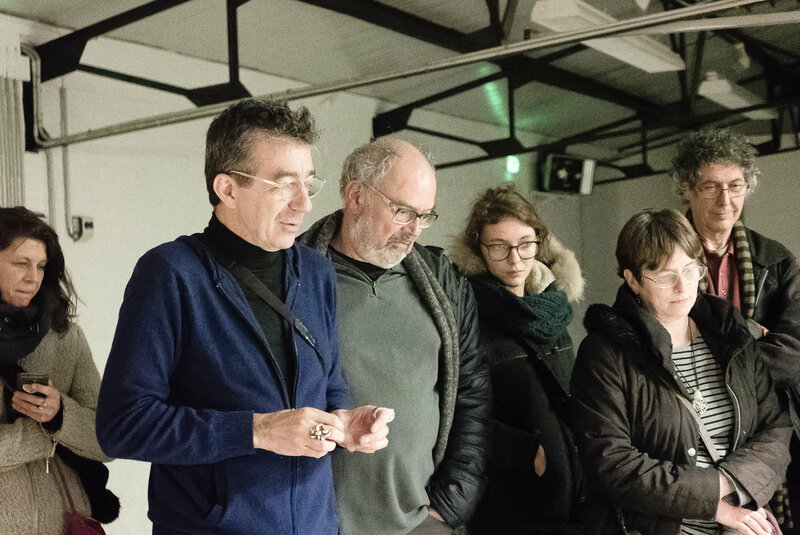 Commissioned by Le Fresnoy - Studio National des Arts Contemporains in France, this art performance was presented at a contemporary music festival in October 2018. We developed with the artists a scenography and live video projections generated in real-time by the sounds and movements of the musician on stage, merging the expressionist visual universe of Alain Fleischer with poetic elements from Stanislaw Lem’s book Solaris. Composed in 2013 by Yann Robin, Symétriades is the second opus of three abstract compositions, all titled after the incomprehensible architectural formations described in Lem’s fictitious discipline of solaristics. Inspired by and written for Nicolas Crosse’s double-bass powerful playing technique, the composition of the musical piece also includes an artificial intelligence that reprocesses in real-time the soloist’s live performance. This electronic system, developed at the Institute for Research and Coordination in Acoustics/Music (IRCAM), distorts, filters and reconfigures the music into a network of 8 loudspeakers and 4 sub-woofers that spatialise the sounds around the audience. 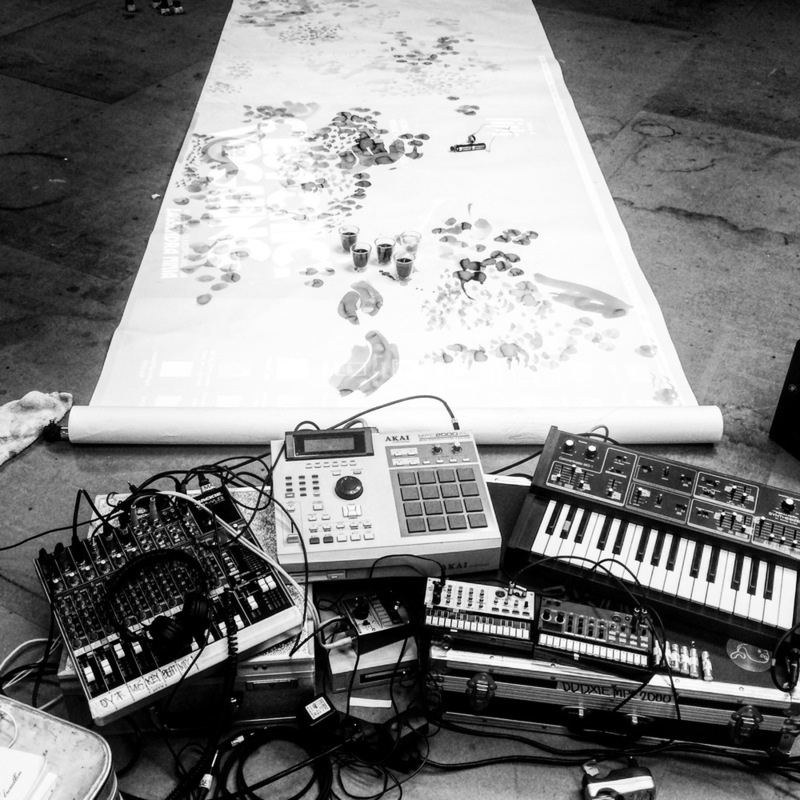 The artists wanted to visually express the contained ferocity of the music, using the metaphor of the bass as an instrument of self destruction. Echoing some of the themes from Lem’s enigmatic book, we constructed the visual narrative of the performance as a succession of digital incarnations of the bass player. 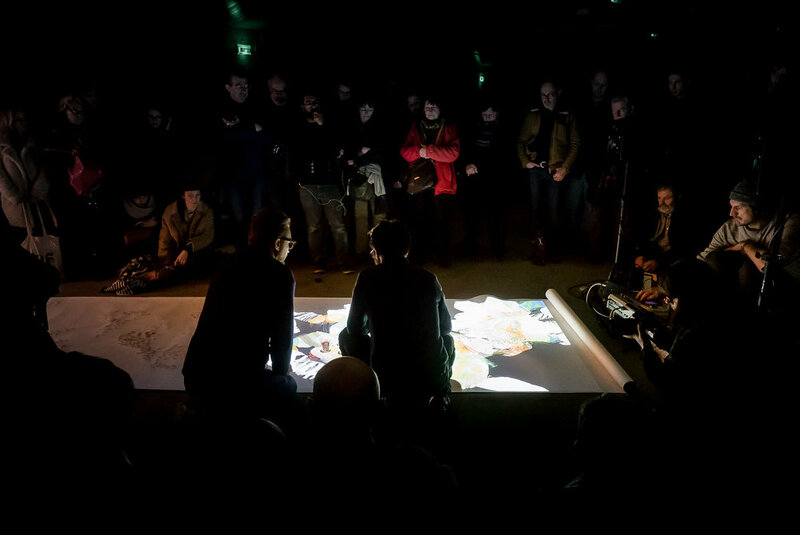 Overlaid onto his physical presence on stage as video projections, each of these “doppelgänger” gets corrupted and eventually destroyed under the assaults of the sounds and movements of the musician on stage. Progressively turning into an abstracted version of his image, it finally recomposes itself into a purely abstract visual representation of the music. To achieve this, our approach mixed real-time filming, 3D motion analysis of the musician on stage and sound analysis. We coded a custom computer program that could dynamically create and composite layers of animations over the image of the musician being projected onto the stage and coordinate them with the electronic sound processing. The dynamic nature of our system allowed the video projections to adjust to the improvisations of the musician during the performance — something that the musical score specifically encourages during certain parts of the piece! Double-bass solist Nicolas Crosse during rehearsals, seen through the shifting moiré of the translucent projection screens of our scenography. In parallel to the visual effects, we also designed a stage scenography for the performance. From an early stage, we wanted to keep the powerful delivery of the soloist at the centre of the visual experience. Its perception by the audience should therefore be altered not only by the means of digital video projections, but also through the physical, direct medium of the scenography. Playing with the perception of depth, we shrouded the stage with multiple layers of finely meshed black fabrics. 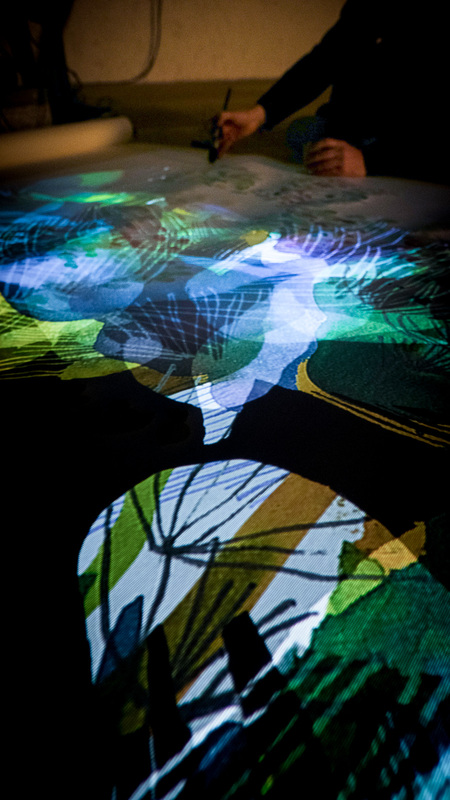 These translucent surfaces create the screen for the video projections superimposed onto the stage and blur the projection into an elusive volumetric presence. 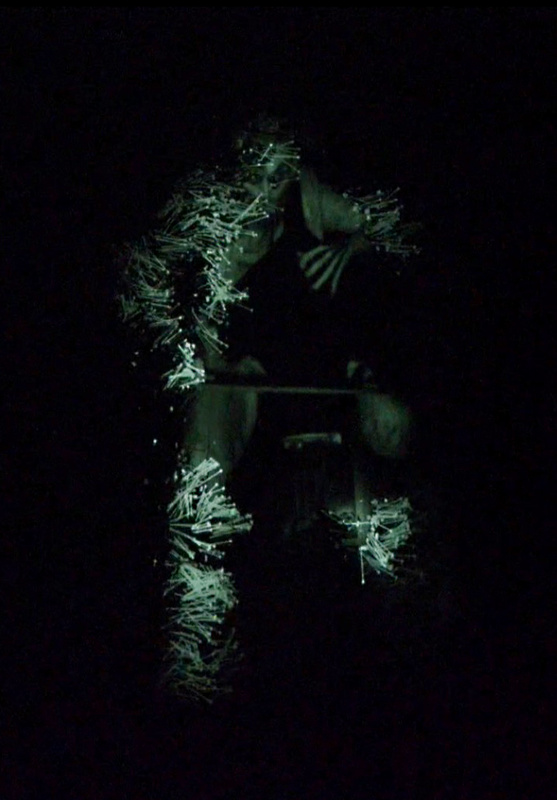 Positioned between the audience and the stage, they further distort the direct sight of the bass player through shifting patterns of moiré, adding to the expressionist makeup and costume of the performer, and echoing the liquid nature of the book’s protoplasmic being. Modulating the contrast between stage lighting and video projections, we could also shift the audience’s focus between the performer on stage and his abstract projected doubles. As we developed and refined the effects over the course of the production phase, we produced a series of video prototypes that precisely simulated the effects, based on high-definition videos and 3D captures taken during the first rehearsal. 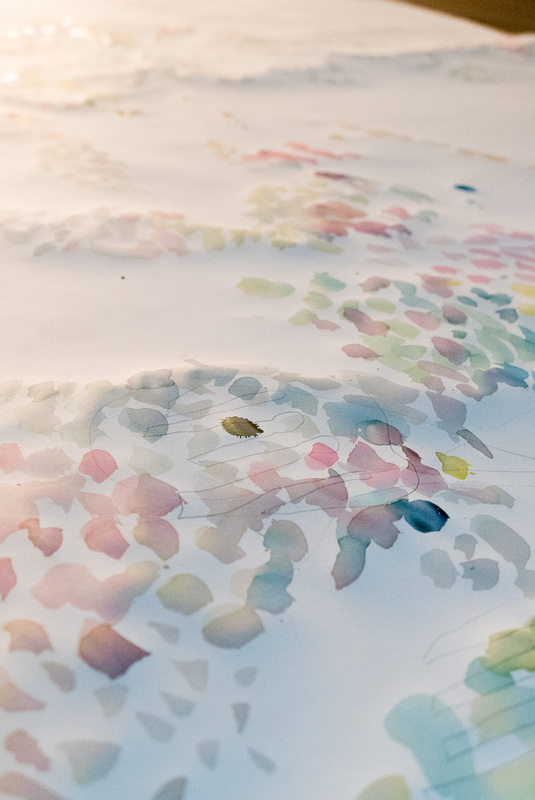 This allowed the involved artists to visualise the performance in real conditions at each design iteration, keeping the artistic discussion open and adjustments to the system simple. 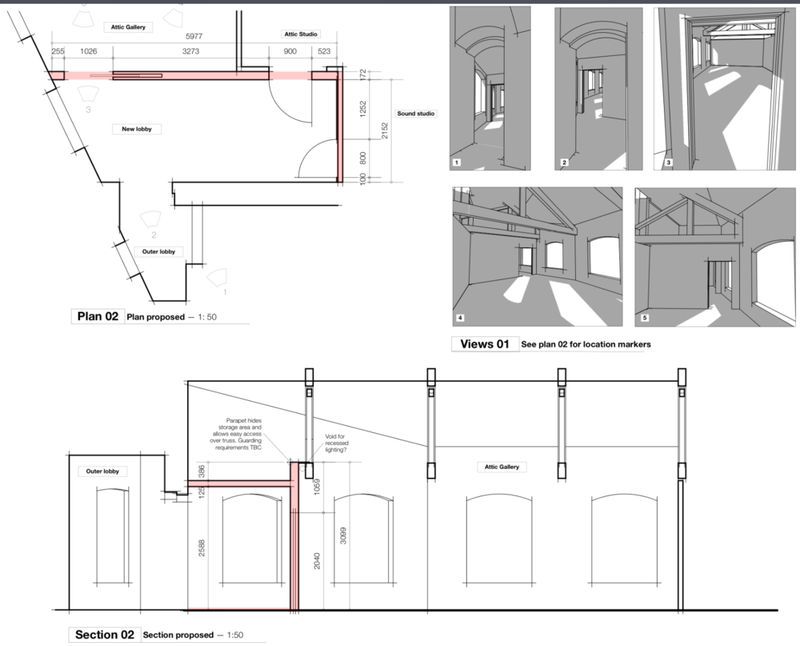 We also took care of sorting out the technical solutions for the performance, selecting adequate equipment and producing detailed 3D models of the scenography and technical workflows, so that its feasibility could be checked with the technical team as the project developed. This is what I call an immersive experience! It was incredible to witness my own avatars being destroyed in real time, as I performed the piece. 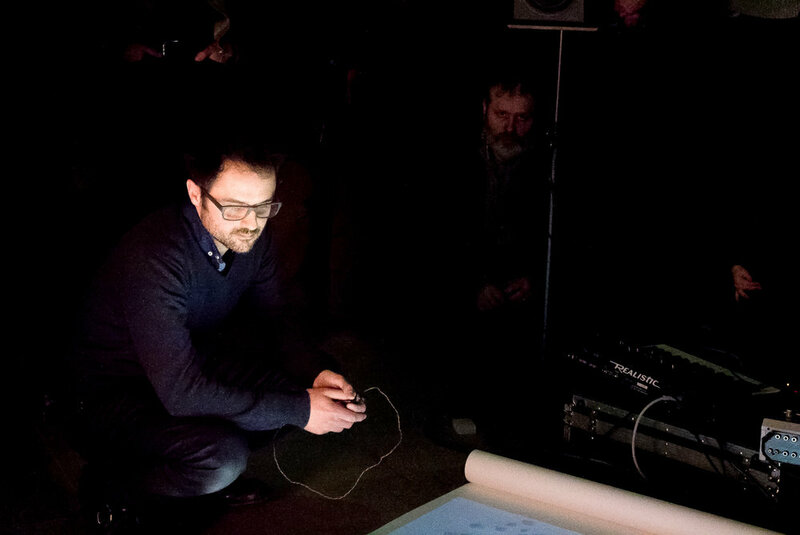 Are you an artist working with interactive installations or performances? 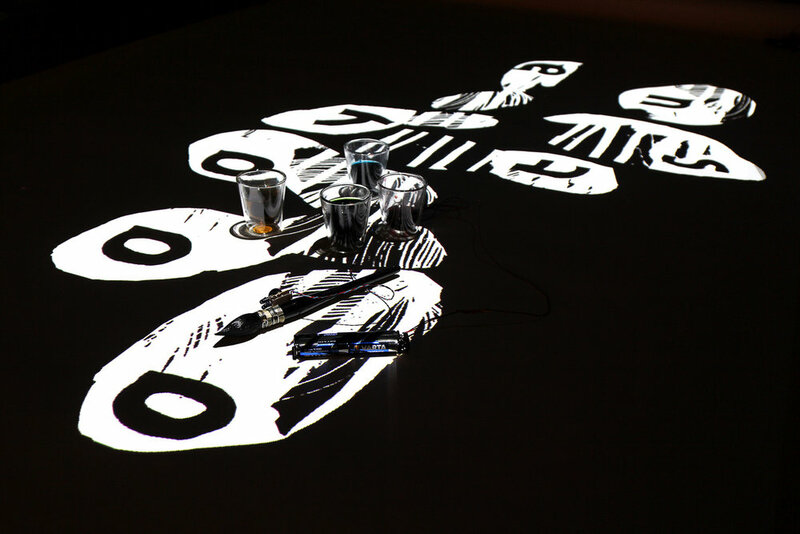 Capitalising on our experience in the Ooo-Ya-Tsu, we developed for the Symétriades/Extension performance a custom program in Processing, which managed the sound, video and motion captures and generated the projected visualisation in real-time. Some open source libraries were also used to interface together the different components of the system: Open Kinect for Processing (for real-time video and 3D analysis on stage), Minim (for real-time sound analysis) and oscP5 (for OSC network communication). 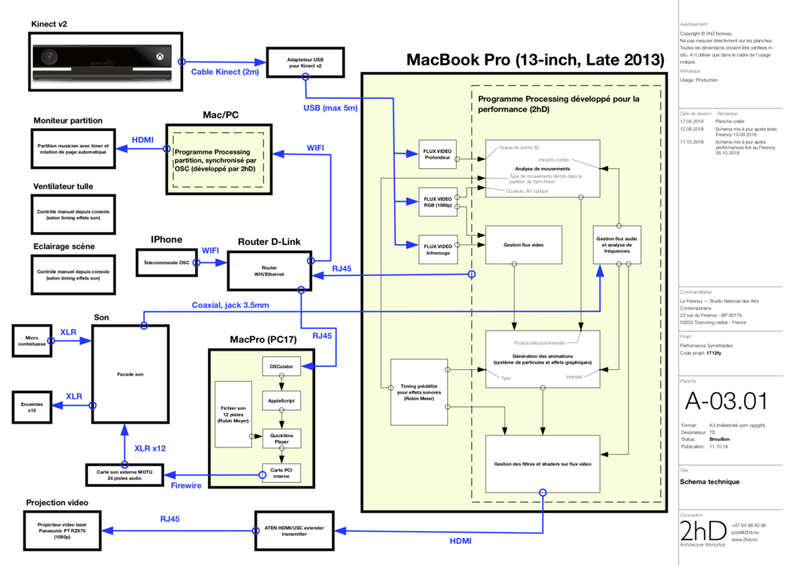 The different computers in the performance were communicating via OSC, using the excellent OSCulator (controlling the multi-track audio playback) and TouchOSC, for which we developed a custom graphical interface to tune the parameters of the Processing program in real-time. I am at the Studio National des Arts Contemporains (a.k.a. Le Fresnoy) for the final rehearsals of the Symétriades art performance, for which we developed the scenography and live video projections. 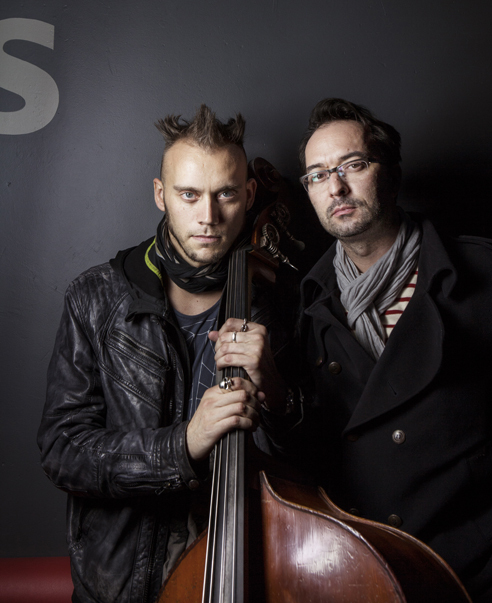 Double bass player Nicolas Crosse will be interpreting Yann Robin’s Symétriades piece for solo double bass and electronics, spatialised over a complex electronic post-processing system and overlaid with the live video projections we have created with visual artist Alain Fleischer. 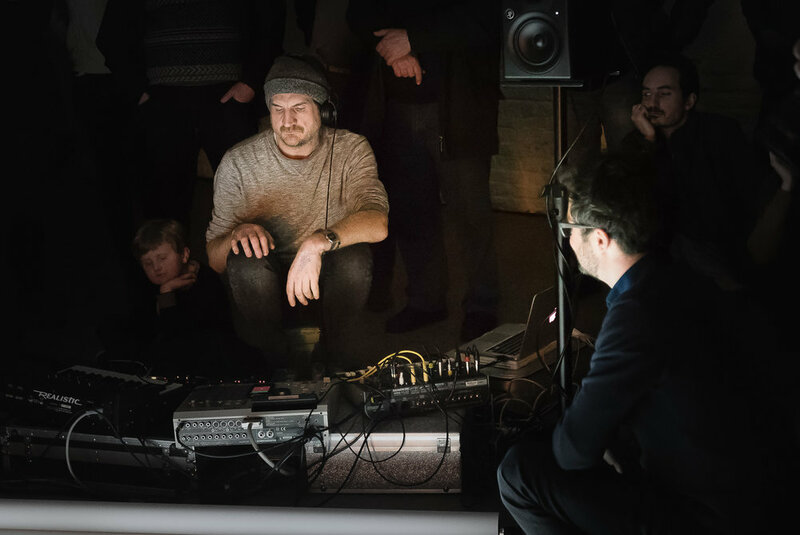 The performance will be shown as part of a contemporary music festival within Panorama 20, the yearly exhibition showcasing the art projects developed at the Studio over the last year. Come and join us for a mighty musical and visual experience! I was at the National Studio for Contemporary Arts this week, for two days of rehearsals for the Symétriades art performance. It was the first opportunity to test in real conditions the scenography and visual effects for the video projections that I had been developing for the performance in the past few months, collaborating with lead artist Alain Fleischer, music composer Yann Robin and double-bass player Nicolas Crosse. 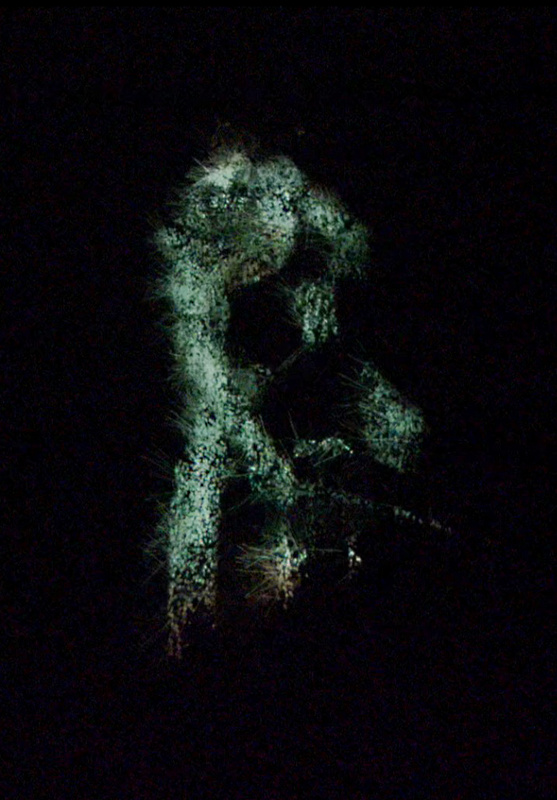 Based on the idea of the soloist immolating himself through the performance of Yann Robin's piece for solo double-bass and electronics, our scenography is playing on the layering of open weave fabrics that are shrouding the musician in shifting patterns of moiré and acting as translucent screen surfaces for real-time video projections. 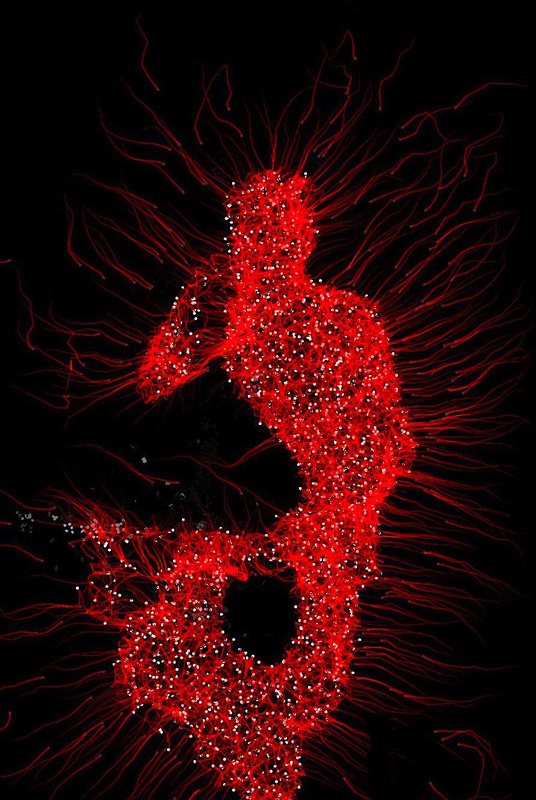 We will be developing further the motion capture techniques and visuals over the summer, until the first public performances of Symétriades on 5th and 7th of October 2018, at Le Fresnoy. 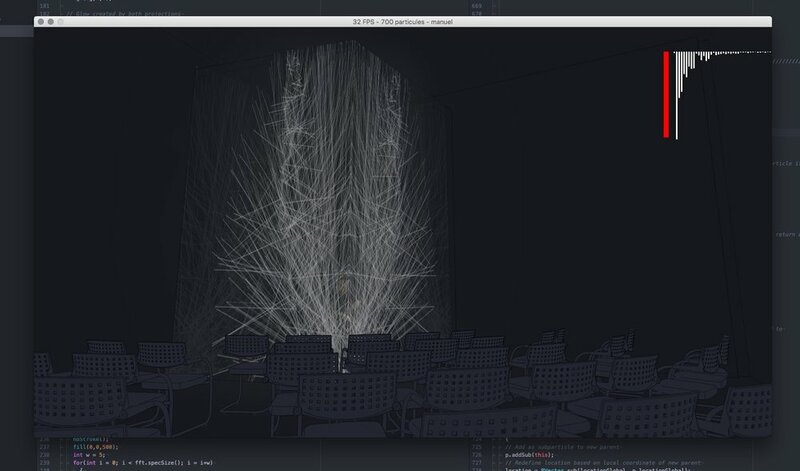 While developing the scenography for the Symétriades performance, I experimented with mixing the 3D model of our proposed stage setup with a sketch program, to communicate our proposed concept. 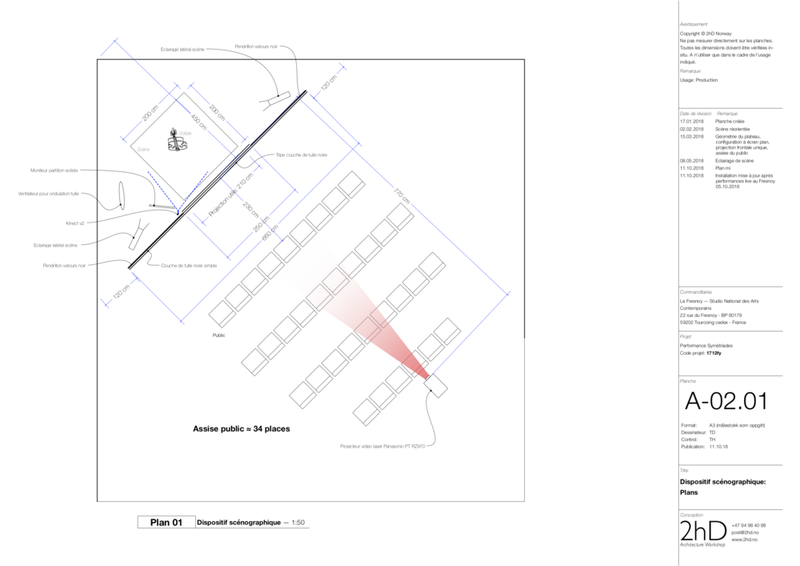 This simple example maps an early animation prototype of our Processing program onto layers exported from our SketchUp model of the scenography. The multiple projections are mapped over surfaces using the KeyStone Processing library, while lighting is controlled by dynamically adjusting layer opacities in the program. 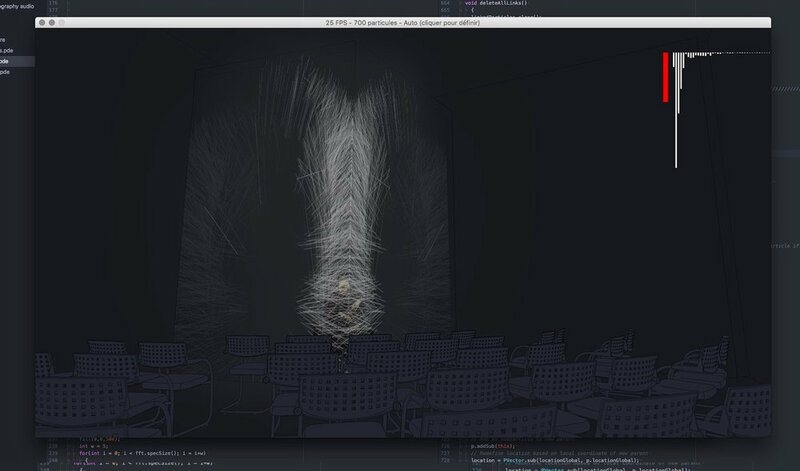 The mapped animation responds to a real-time spectral sound analysis of a rehearsal recording, as well as mouse movements on the modelled stage screens. 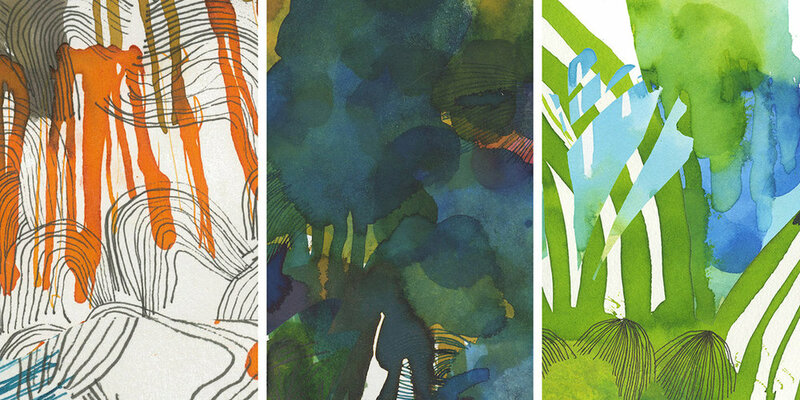 A recent project at One Thoresby Street artists studios and gallery gave us a chance to develop new techniques for designing with self-builders. 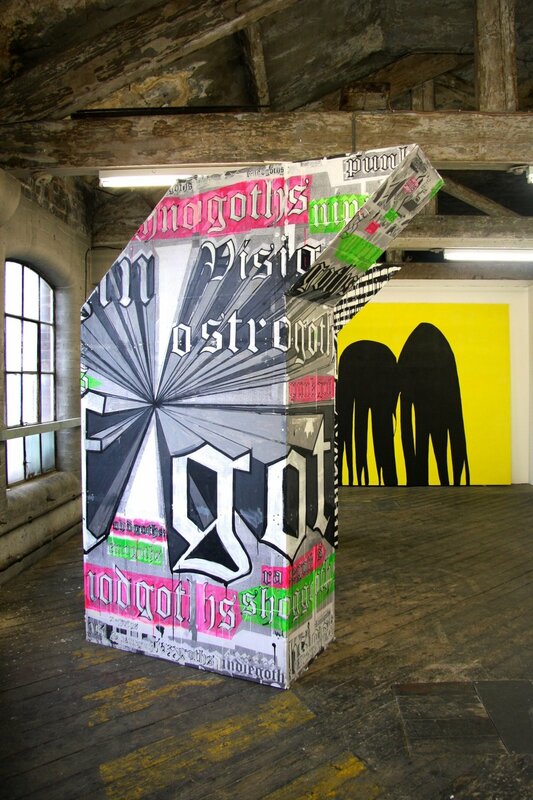 As part of a longstanding relationship with the artists at One Thoresby Street (OTS), we were asked to design a lobby space for the top-floor Attic Gallery. 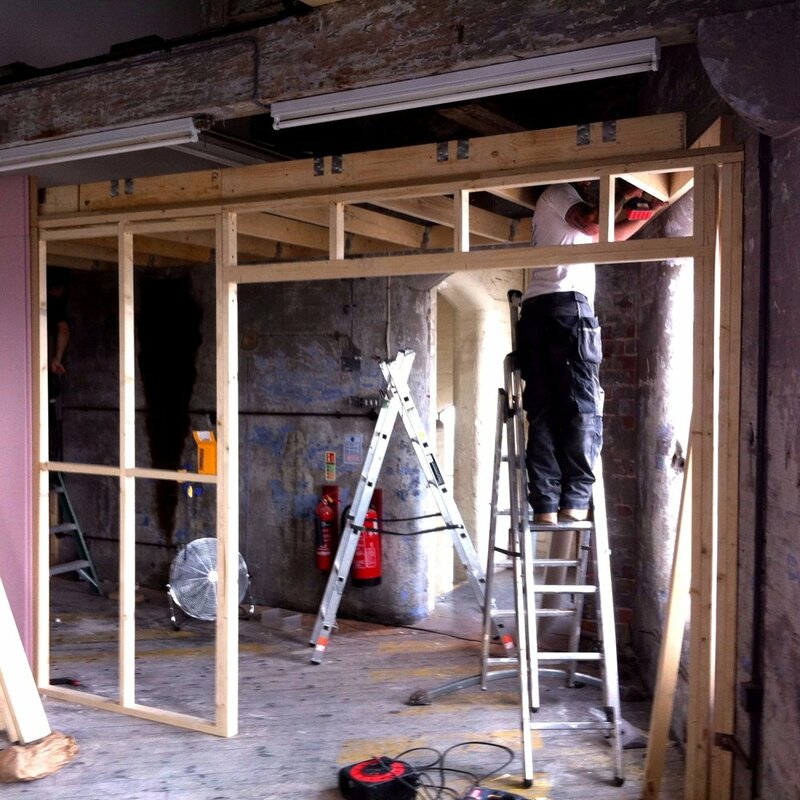 This would sort out circulation between the gallery and studio spaces and provide a vital fire safety feature by separating the occupied space from the access stairwell. Unusually, the lobby would be built entirely by the artists themselves. We approached the project through a careful survey of the existing building and designed the lobby to create a great experience for visitors as they approached up the stairwell. A sliding fire door, held open on electronic sensors linked to the fire alarm system ensures that movement and views through are eased. The height of the lobby is reduced to contrast with the tall gallery space, which also minimises the materials used and creates a storage and projection deck overhead. High technical standards had to be met in the project to create a fire resistant construction, the budget was tight for materials and the building team (skilled makers but not construction professionals) needed to have excellent clarity over the build process. 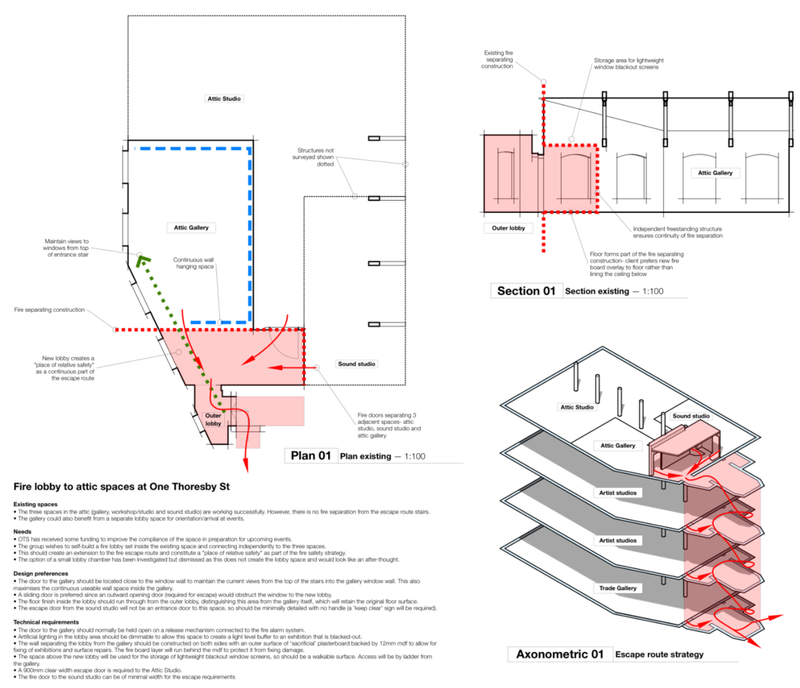 This put huge demands on the communication of technical information, so we took an approach more normally found in larger scale projects - we created a 'Building Information Model'. This was a CAD model showing every structural member, board and component, organised to give the artists a coordinated picture of the materials to order, the dimensions for cutting, the assembly sequence and the spatial relationship between every item in the final assembly. We then lent the group a laptop with the CAD model installed so that they could take the information directly off it on site. 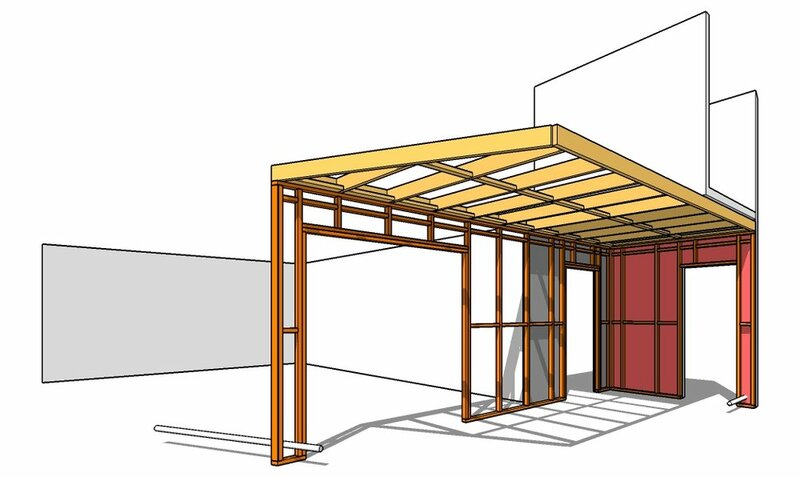 The build proceeded smoothly with a tiny number of requests for additional information, wastage of materials was kept to a minimum and the end result is a happy self build client, an effective adaptation and an safer, better Attic Gallery space at OTS. Are you an artist or a craftsman? We can help you realise your projects and explore new creative routes.